Based in Freshwater and Totland, on the Isle of Wight, we pride ourselves in being a strong community-based band, who create a loud and vibrant atmosphere wherever we play. Our gig list encompasses many carnivals and special events such as Yarmouth Old Gaffers, Island Games and the Isle of Arts Festival. We are also available for fundraising and charity events as well as private functions. 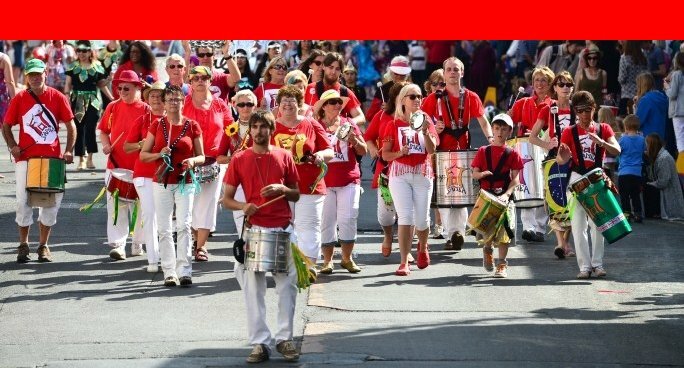 We are a community samba band based in Freshwater and Totland, Isle of Wight, with members mostly from the West Wight, and a number from Cowes and Newport. We play various styles of Samba - Rio-style, Samba-Reggae and Maracatu, and with influences from other musical genres. We are always looking for new members of all abilities and ages! Rehearsals are on Mondays from 6:15pm to 8:30pm at Totland Church Hall, The Broadway, Totland. The band is open to any age, but under-sevens may find it too challenging. You don't need to own or play an instrument as we offer a full training programme in a relaxed and friendly atmosphere and we can loan the appropriate instrument throughout your membership. Cost is £4:00 per adult member per rehearsal attended, Under 18s and students £1, and with your first session free! The band is a non-profit making community band. FaT Samba play all around the Island in numerous events and we are proud to support many charitable events such as Walk the Wight.